But it’s an email I have to write, to prepare you for the coming onslaught of ‘Red Flag Gun Seizure’ legislation not only here in Iowa — but across the country. This legislation is the “holy grail” of Michael Bloomberg lobbyists trolling around the State Capitol in Des Moines. Their support for this legislation is giving the bill a real chance to become law in states like Michigan, Pennsylvania, Ohio, and many others. It’s also why Speaker Pro-Tem Matt Windshitl can advance this legislation without facing any repercussions from the NRA and their weak-kneed instate affiliate, the Iowa Firearms Coalition. 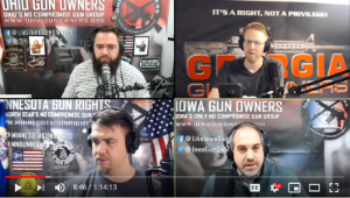 I’ve just posted the podcast on the Iowa Gun Owners YouTube page — please click below to watch it. To renew your Iowa Gun Owners membership for 2019 — Click Here. To join Iowa Gun Owners for the first time — Click Here.